The Orange Whip is a popular training aid designed to improve your balance, clubhead speed, and rhythm. It is frequently advertised on TV and has received a lot of positive reviews online… so we thought we’d test it out for ourselves! The Orange Whip is a flexible shaft that is weighted at each end. It comes in 3 sizes that can be used to train short irons, mid irons, and the driver, respectively, or for golfers of different heights. By progressing through a few simple drills, the Orange Whip helps to develop your rhythm, balance, and give you a more “connected” golf swing. We tested the Orange Whip on golfers of different ability levels with good results. To understand how the whip works, think of it like a pendulum of sorts. The weights on the ends of the flexible shaft give it a natural rhythm. It feels very smooth when you swing with this natural rhythm. But if you try to fight the pendulum, you get rather jarring feedback. The effect is a bit like pushing a child on a playground swing. If you push too early, you will get knocked backwards. If you push too late, you don’t add much power and will fall forward chasing the swing. Similarly, if you start your downswing too quickly with your arms (ie, come “over the top”), the Orange Whip will pull you off balance. The same thing happens if your lower body gets too far ahead of your upper body. And just like it is very easy to learn to time the playground swing, it becomes easy to time your golf swing when you are using the Orange Whip. After a few weeks of regular use, our testers found they had improved their timing and tempo. The Orange Whip sells for $109, making it one of the more expensive training aids of it’s type. 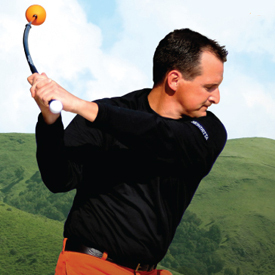 The Orange Whip is a unique training aid that is effective at improving tempo and teaching you to synchronize your body during your swing. It is a bit expensive and not a comprehensive solution, so we recommend it as a complement to your training if it fits your budget! Can the orange whip be used during the round? Can I take a few swings with the “whip” before teeing off in the middle of a round and not violate a rule? Hi Paul, here is the official ruling on the Orange Whip from the USGA. Basically you can have it in your bag and it does not count as 1 of your 14 clubs, but you cannot use it during your round.